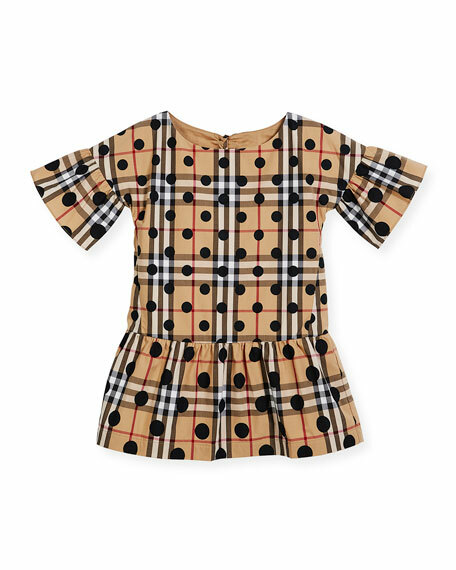 Burberry "Anabella" dress in check and polka-dot print. Crew neckline; half button back. Half sleeves with fluted ruffle cuffs. For in-store inquiries, use sku #2395050. 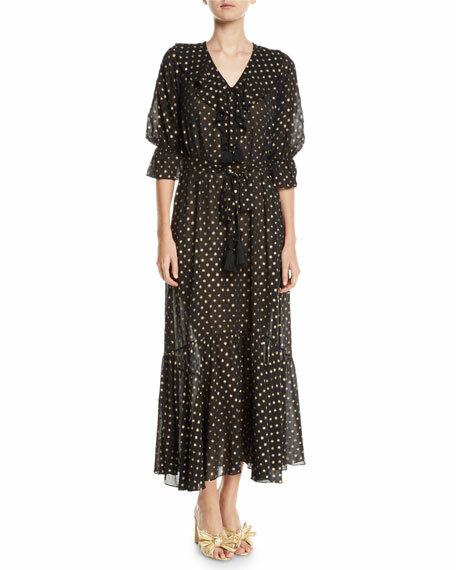 Caroline Constas "Audrina" dress in polka dots. High neckline. Sleeveless. Ruching at skirt. Body-con silhouette. Flounce hem. Hidden back zip. Mini length. Silk/viscose/spandex. Made in USA of imported material. 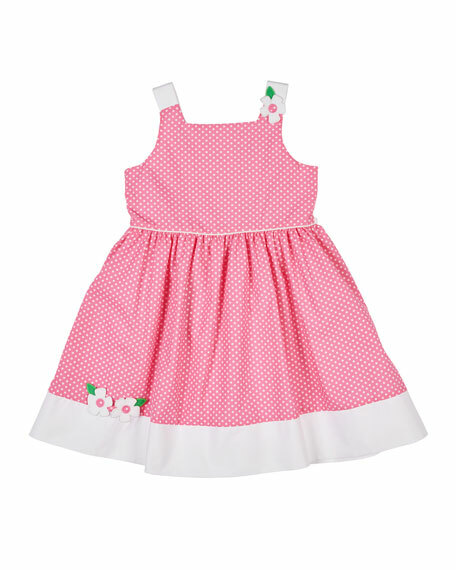 Figue "Nyla" dress in golden polka-dot georgette. Approx. 53.5"L from shoulder to hem. V neckline with cascading ruffle trim. 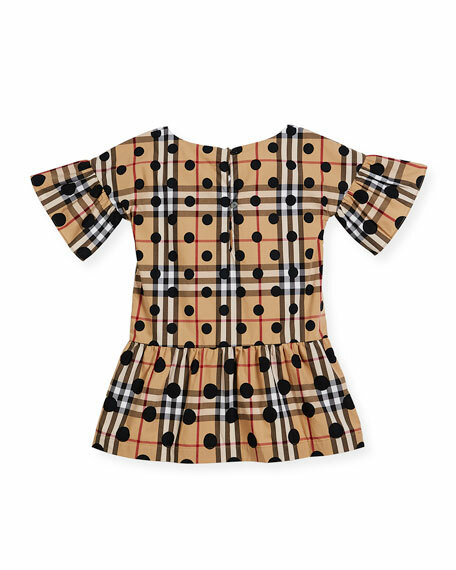 Three-quarter sleeves. Self-tie at waist with tassel accents. Column silhouette. Flounce hem. Viscose. Imported. 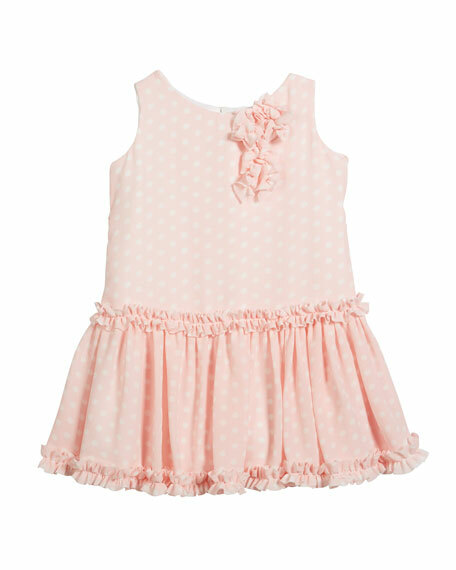 Florence Eiseman "Coral Gables" polka-dot dress, embellished with flower appliques. Crew neckline. Sleeveless; buttoned shoulder straps. Thin self-tie sash. A-line sweep. Back zip. Polyester/cotton. Imported.